Tuesday night: Partly cloudy with lows into the 50s. Wednesday: Partly cloudy with an spot PM shower possible, less humidity and more fall-like with highs into the upper 60s. After a summer-like day across New England under mostly sunny skies, this evening will remain on the mild side with the humidity continuing to step down. Overnight lows slide into the upper 50s south, 40s to 50s to the north under mostly clear to partly cloudy skies. However, overnight, we will see a shifting breeze that will bring a more typical fall-feel to the air by Wednesday. We’re talking high temperatures into the mid to upper 60s south, upper 50s to the north as the wind shifts to out of the northeast and the cool, Canadian air settles in. By Thursday, highs could struggle to make it out of the 50s for most! Let’s not get ahead of ourselves though. 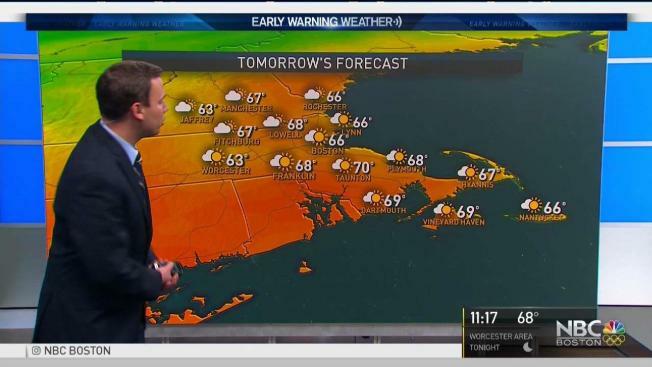 As for any chance of showers – some will make a move on New England from Pennsylvania and New York Wednesday evening and night, and may even deposit a few drops on Connecticut or Southwestern Massachusetts, but mostly will meet their demise as they encounter our strengthening dry, fall airmass. Although gone from New England, warmth won’t be far away, and a wind shift from the southwest will bring that warmth back to us Saturday and, depending on the timing of an approaching cold front, quite possibly Sunday, too – with enough warm air to reach 75-80° again. By the end of the weekend, a new surge of fall chill will be arriving, and our temperature see-saw so classic of autumn will drop lower for the end of the exclusive Early Warning Weather 10-day.